I remember when I was at school there was a point when friendship bracelets were all the rage. My best friend made me a few and then tried to teach me how to make them. 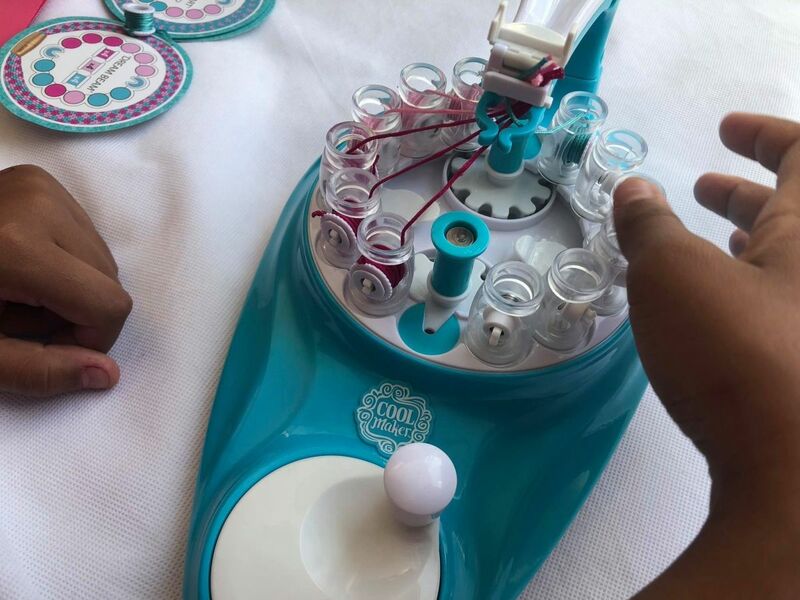 I never truly got the hang of it and I wish the KumiKreator from Spinmaster had been available back then as it would have made things so much easier for me! My first thought was what does Kumi have to do with bracelets? The answer to that is that the bracelets are inspired by the art of Japanese Kumi bracelets…hence the name KumiKreator. 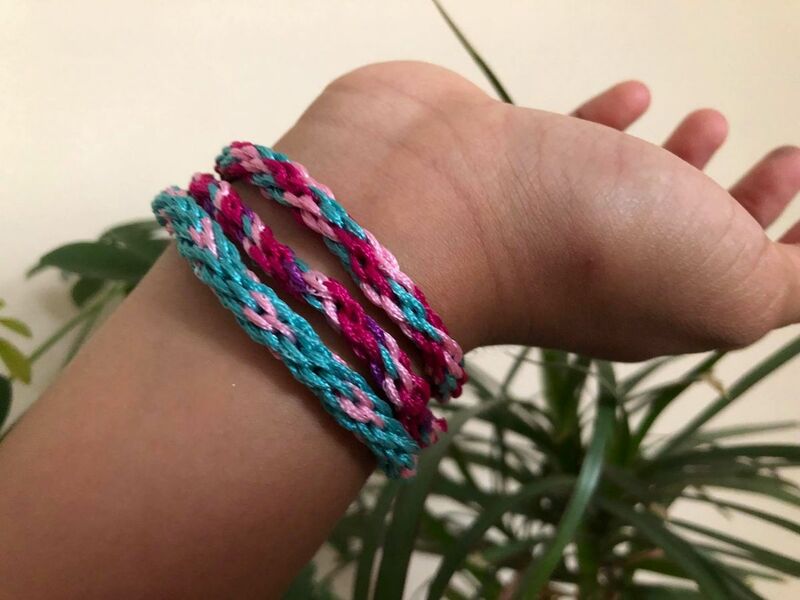 The KumiKreator is recommended for ages 8+ and my eldest at 12 years old was quite happy to receive it and make some bracelets. Bee was a little bit miffed that she couldn’t have a go but after seeing my eldest do it I thought it might be a bit too complicated for her at age 5. Although the KumiKreator does come with instructions, I would highly recommend that you watch the video on their website. It makes it all the more clearer if you see how it is done and you are less likely to make mistakes. 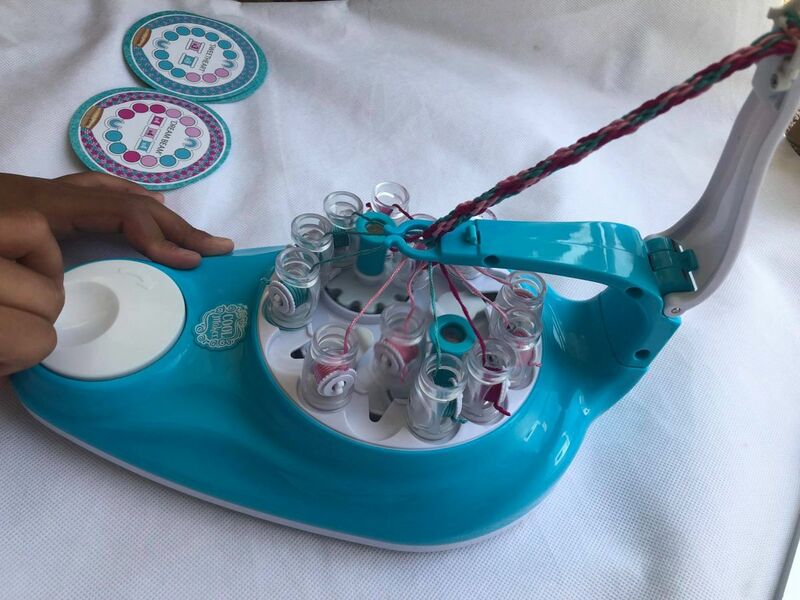 There are also videos to help you if you do have any problems like the thread getting stuck and the machine not turning. However we had none of those problems. 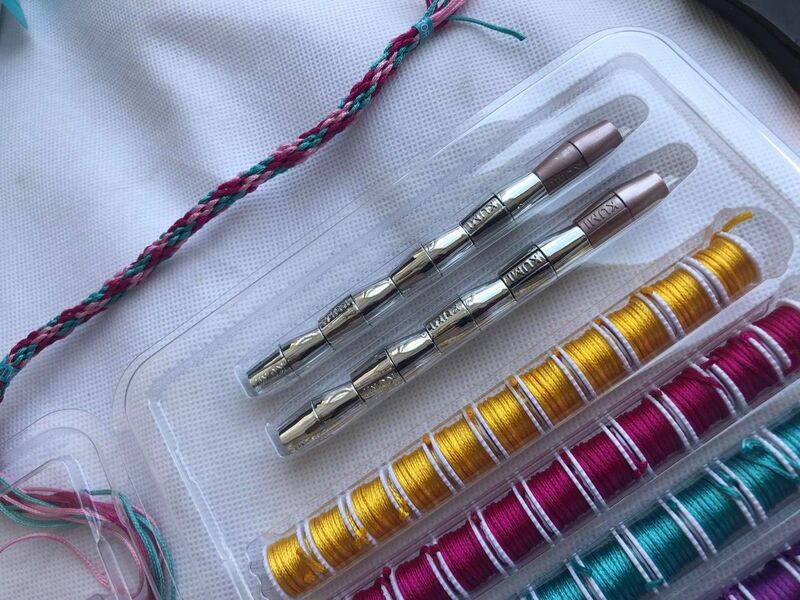 You can make an 8 thread bracelet or a 12 thread bracelet. My eldest opted to go straight for a 12 thread bracelet called ‘Dream Beam’. 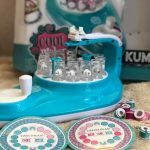 Once you have lined up the KumiKreator into the correct position, you have to load the spools of spring onto the machine. This is easy as they just click on. They can also be removed easily if you put one in the wrong place. Next step is to pass the thread through the top of the spool and then up through the white arm clip. It is important to ensure that the thread is tight and the top of the thread is NOT above the white arm cap. If the thread is loose or above the white arm cap then you are likely to have problems. Once all the spools of thread are in place you simply turn the handle at a steady pace until the arm lies flat with the red lines lined up. Once the bracelet is done you use a sticker to tie up the top end. Using the measuring bracelet you measure the length you need and then put a sticker at the end of the bracelet and remove the bracelet from the KumiKreator. 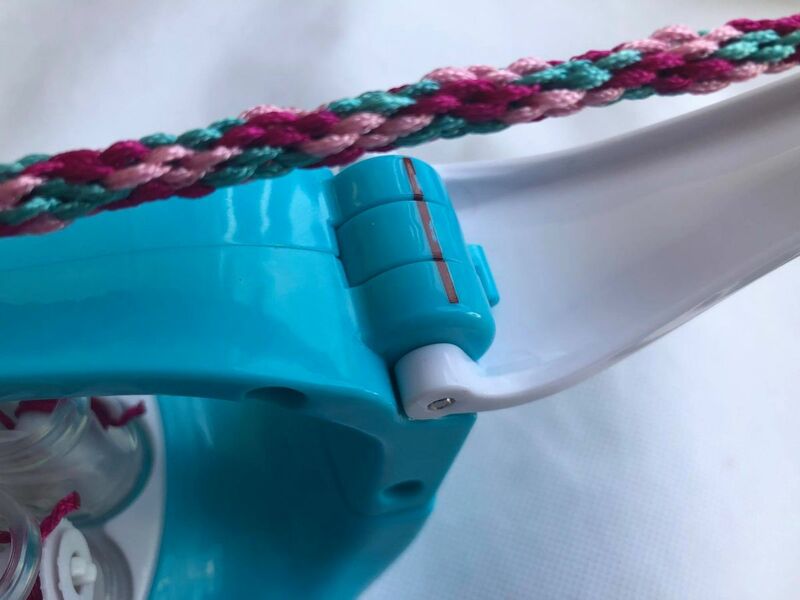 Then it is a simple matter of cutting off the excess threads, adding on the end caps and clasps…..and your bracelet is done! The eldest has been enjoying making the bracelets. Although I helped her with the first bracelet, after that she was able to make them on her own with no help. 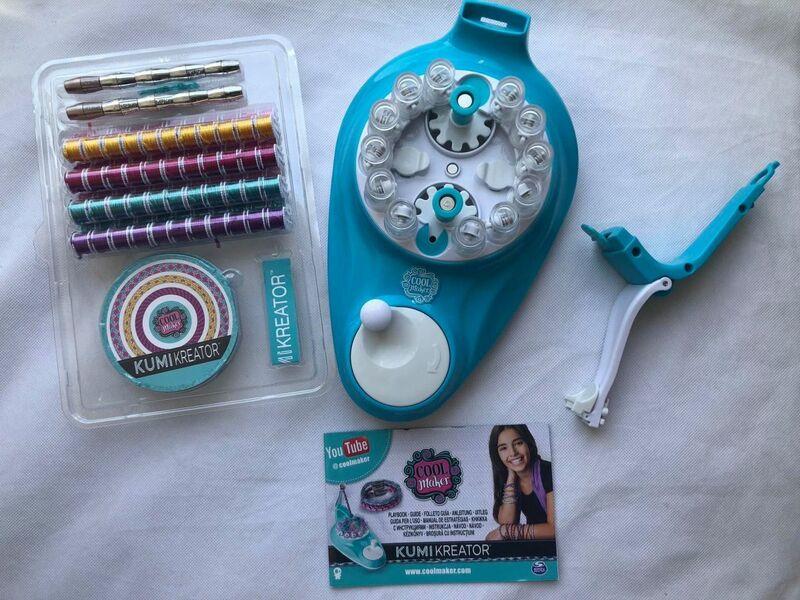 With the KumiKreator you can make up to 10 bracelets. However refill packs are available if you wish to make more. I must admit I did feel like 10 wasn’t a lot and it would be better if you could make more without having to spend more to get more thread. We found the whole process straight forward and I can see the KumiKreator being used often by her! I’m guessing I will be asked for more thread soon! 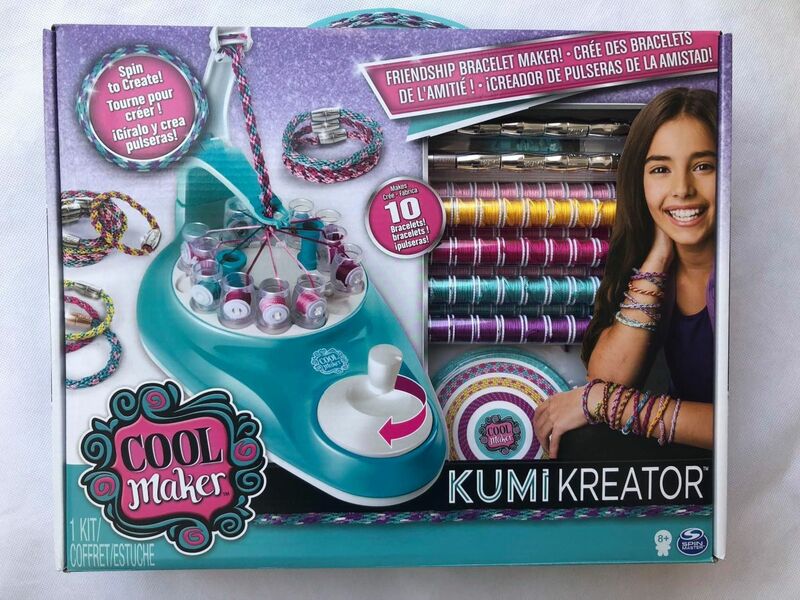 The Cool Maker KumiKreator from Spinmaster is available from most toy stores and also Amazon: Cool Maker – KumiKreator Friendship Bracelet Maker, Makes Up to 10 Bracelets, for Ages 8 and Up . 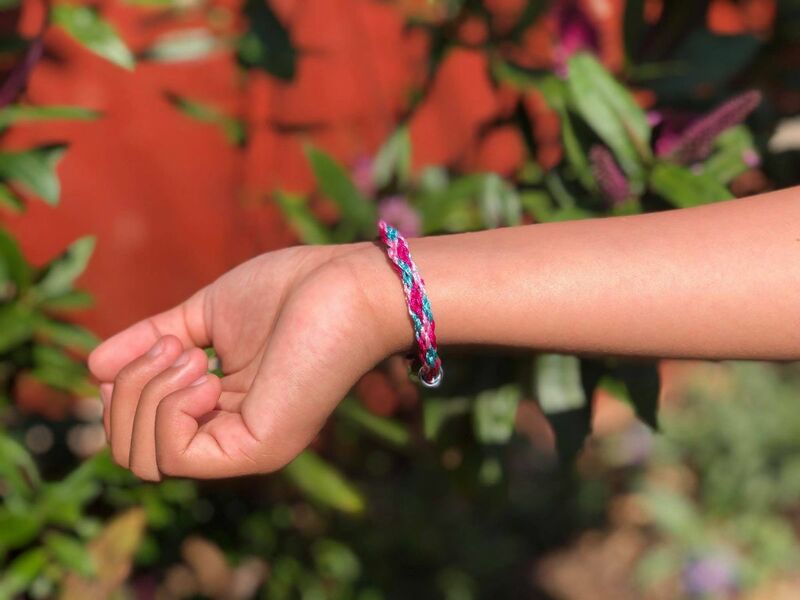 If you have a child that loves bracelets and making them, then they are sure to love the Kumi Kreator. Disclosure: We received the KumiKreator for the purposes of review. All thoughts and opinions are our own. This post contains affiliate links. This post brought back so many good memories ❤. I remember spending night after night making bracelets for all the special friends. Looks like this gadget can save that time and the bracelets look pretty neat. 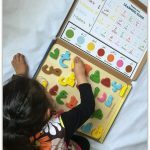 Great review, very detailed and explains everything well. I actually wish I could buy this for myself! It looks fun and the bracelets are really cute! How lovely!! Seems like friendship bands/bracelets are still a rage these days. Well Done to your eldest, the bracelets she created look fabulous, I’m sure she is going to be very popular amongst her friends. 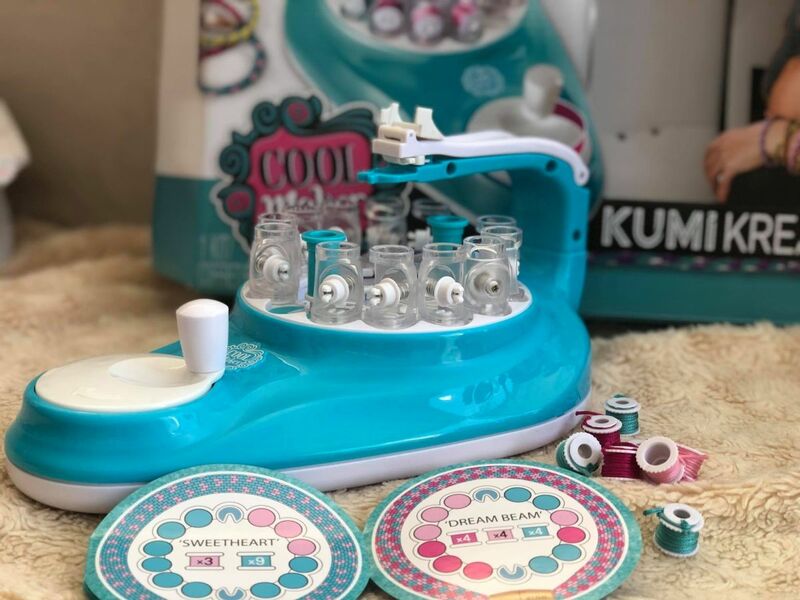 The Kumi Kreator looks pretty cool and my daughter would definitely love it! However, I like the feel of creating crafts with my hands and not use a whole bunch of gadgets. I’ve always been fascinated with bracelate makers; This one looks so cool! 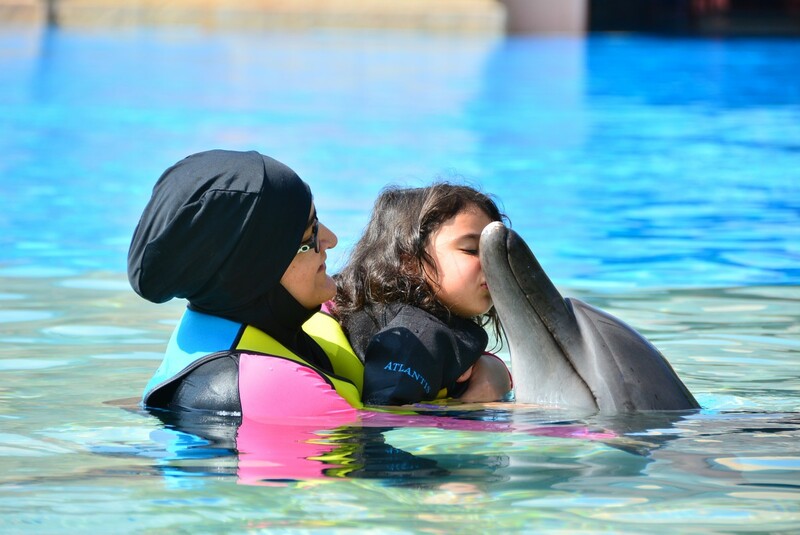 I’d love to try it with my niece! Thanks for sharing! Whoa! Ma shaa Allah This thing is so cool! And the bracelets are so pretty! Jazakallahu Khayr for sharing this! My only girl is found of these bracelets and other jewelry items. I Made with hands for her, but this product is really time-saving.